June 5th strikes every year to recall about the protection of nature for future generations, it’s the nature day and it goes green and clean throughout the world on this special day. “Planting trees and going Green” should be followed by everyone not merely in the World Environment day, it should be practiced throughout the year. Nature don’t belong to the people, instead people belong to nature. In this world Environment day, let’s take an oath to preserve the nature’s belongings that we are using for our future generations. 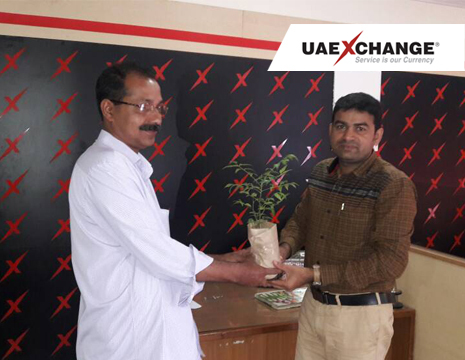 Upholding this year’s theme “Connecting people to nature”, UAE Exchange branches celebrated World Environment day. Branches had distributed tree saplings to the customers with the aim of making people more responsible in planting trees for bringing “more green more solace”. UAE Exchange India also came up with a “Watch, Write & Win contest” in this nature’s celebration for making people more engaged to this special day. Creative caption or description for the World Environment day video uploaded in the website or Facebook will get a trendy Bluetooth Headphones/Headsets. The contest is open to the public from June 5th to 8th 2017.